Happy Monday, friends! If you follow me on Instagram, then hopefully you’ve seen me sharing a bit about Skinnytaste’s new cookbook that comes out tomorrow! It’s called One and Done and it’s officially my new favorite cookbook. 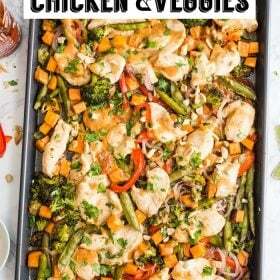 The whole cookbook is filled with easy recipes that can be made on one skillet, in one pot, in a slow cooker or Instant Pot etc. It’s SO good and exactly what I needed in my life right now. 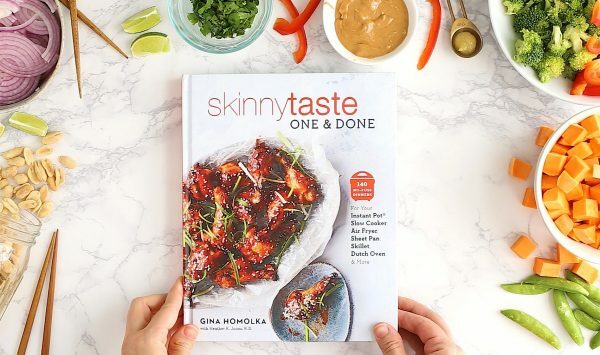 And since it’s the THIRD amazing book from Gina over at Skinnytaste, you know the recipes are going to healthy AND delicious! I work with Gina to create some of her recipe videos which means that I get to make her recipes on a weekly basis. I’ve never been disappointed and I seriously can’t wait for you to get your hands on this cookbook! IN FACT, I’m giving away a copy of the cookbook over on my Instagram today so be sure to hope over and enter to win a copy! OKAY. 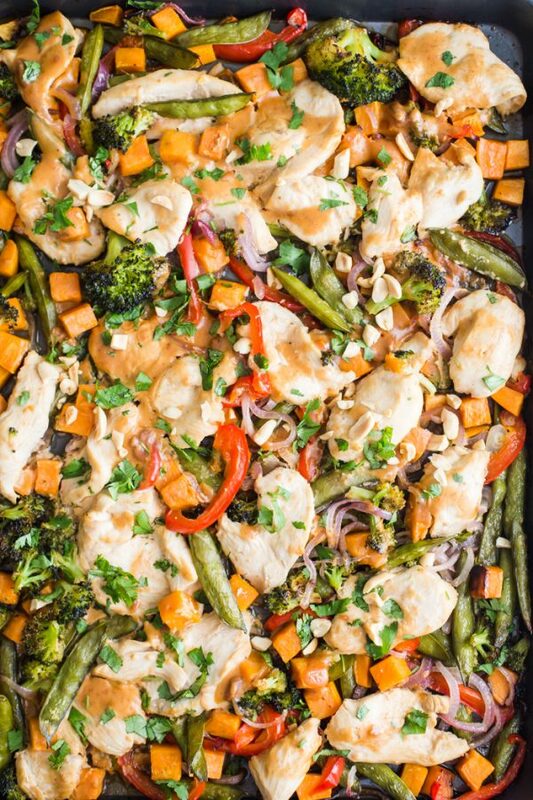 So, lets talk about this Sheet Pan Peanut Chicken and Veggies. 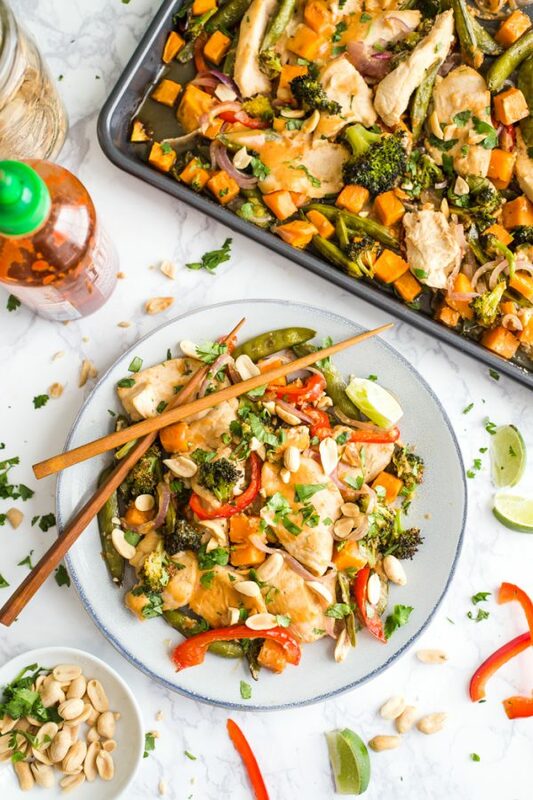 Peanut sauce is maybe one of my favorite things in all of life so when I saw this recipe, I KNEW it needed to be in my life. 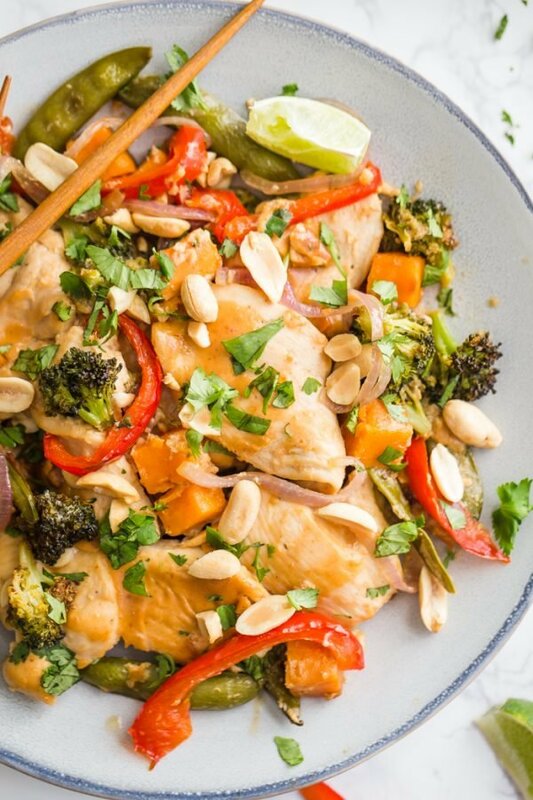 But, many of you also thought that because out of the 6 recipes I proposed, this Spicy Peanut Chicken recipe got the most votes when I asked which one I should make. 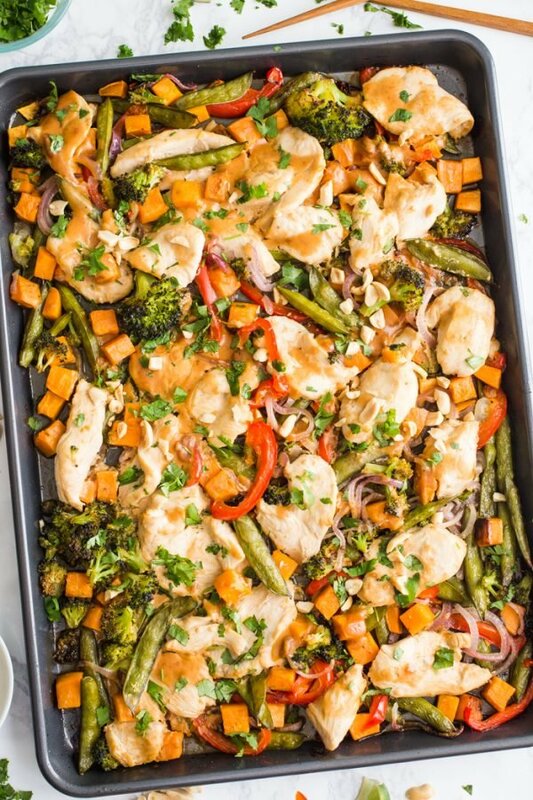 Like all of the other recipes in One and Done, this sheet pan recipe is SO easy! First we’ll make a simple peanut sauce by whisking together the peanut butter, coconut milk, soy sauce, lim juice, sriracha, and ginger until smooth. Then we’ll place all of the veggies on a tray to bake for a bit while you prepare the chicken. The chicken eventually gets put on the tray, nestled among the veggies, and baked for an additional 15 minutes until cooked through. Don’t forget to enter my giveaway AND order your One and Done cookbook that comes out TOMORROW (Oct. 9)!! Guys, it’s SO GOOD! To make the peanut sauce, whisk together the peanut butter, coconut milk, soy sauce, lime juice, Sriracha, and ginger in a small bowl until smooth. Adjust a rack in the center and another rack ~4 inches from the broiler. Pre-heat your oven to 425 degrees F. Prepare a large baking tray, roughly 18×13 inches, by spraying with cooking spray. In a medium bowl, combine the chicken, soy sauce, lime juice, garlic, ginger, and 1/2 teaspoon of salt. Pour half of the peanut sauce over the chicken and stir. 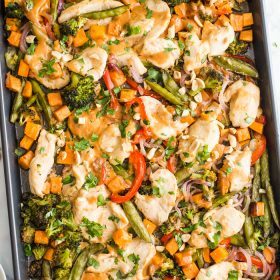 Place the sweet potatoes, broccoli, red onion, bell pepper, and sugar snap peas on the prepared pan and toss with sesame oil as well as the remaining salt. Roast in the oven on the center rack, tossing halfway, for about 25-30 minutes or until the sweet potatoes are almost tender. Nestle the chicken among the veggies, pour the remaining marinade over the chicken and then roast until the chicken is cooked through, about an additional 10-12 minutes. Switch the oven to broil and move the pan to the higher rack to broil until the chicken is browned, about 2-3 minutes. 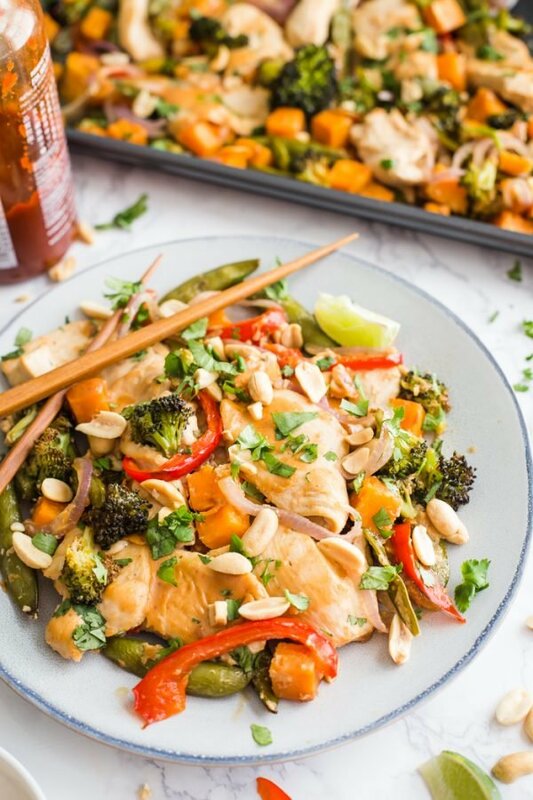 Serve, top with peanuts and cilantro and ENJOY! This looks delicious and fab. Definitely will try. Can you freeze the leftover coconut milk? yes! I’ve done this a few times. I can’t say for sure how long it is good in the freezer.